This is your chance to bring your Ss close to a place in South America. 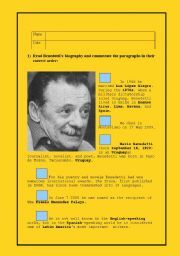 Furthermore, they´ll have the chance to read and choose the best answer and complete a grid. 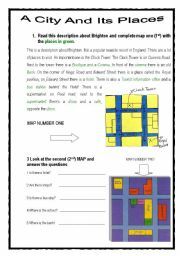 This worksheet is based on a reading and two maps. St have to read to complete a map, use abstract thinking to answer, choose from options given and finally, write about there twon using the first reading included in this WS. 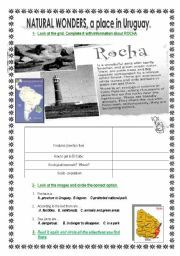 THIS WORKSHHET IS BASED ON ONE I UPOLOADED SOME TIME AGO, HOWEVER THIS ONE HAS SOME MORE ACTIVITIES SUCH AS FILL IN A TEXT WITH VERBS IN THE PAST, WRITING A BIOGRAPHY AND A LISTENING. 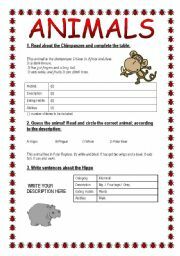 This worksheet is about some animals which live in the Jungle or the Savannah; their eating habits and desctription. It´s also about animals classification connected to biology. 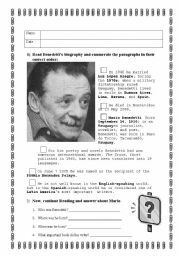 Students in this worksheet have to guess, find, read and write as well as classify. It´s ideal if you want to foster those abilities in your students. Here you will find a texts of a football player an activity on the texts and other activities conncted to the topic Sports. Writing, vocabulary, word order, are also found. This workheets aims to revise a bit of personal imformation, descriptions, family, questions, and some basic vocabulary. Reading, writing are the skills fostered here. Ss will have tha chance to read for pleasure about two of the greatest Latin American writers. Ss will have to answer questions and completing sentences using a map. They will also have to ask questions and anwer them. 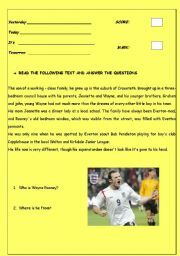 If it is about sports, this is the right worksheet to download. By doing this you will give your Ss the chance to be in contact with readings, back up their choices, writing sentences, among others.